The Mossad HaRav Kook Annual Sale every year after Pesach is a major event for Seforim lovers all over Israel. Indeed there is almost no similar Seforim event in the world that for decades continues to attract major crowds every year. The sale is taking place this year from Nissan 23-30 5777 which is from Aprill 18 to April 25 2017. Mossad HaRav Kook only ships Seforim within Israel. For the 10th consecutive year only VirtualGeula is authorized by special arrangement to accept orders and ship directly from the Annual Sale to addresses in the Diaspora. The Judaica Archival Project and VirtualGeula offers its active Subscribers and Members a chance to participate from anywhere in the world at the same discount prices you would pay as if you attended the sale yourself (and without the line-ups). This year there are up to 65 % discounts ! If you wish to participate in the sale and are not yet an active subscriber or member – please sign up now. Then scroll down to do your shopping. The order form is here. This sale is for JAP members and subscribers only. 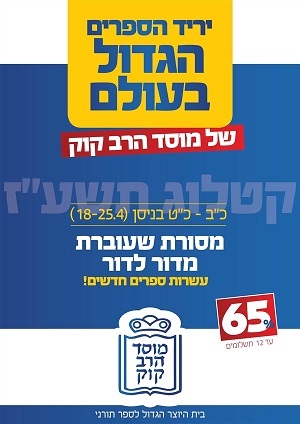 Regular members may order up to 5 titles or 10 kilo of Seforim. Subscribers may order up to 10 titles or 20 kilo of Seforim. Default shipping will be by via registered surface mail for other options click here. The current price for registered surface mail is about $18 for the first kilo and $4.00 for each additional kilo. EMS, Air freight, UPS, Fedex and other shipping options are available on request. Each parcel will entail a packing and handling charge of 50 sh. You must include a valid international Visa, Mastercard or Amex credit card or make a paypal deposit. You must choose one of the membership plans to qualify for the sale prices. You must use the VG orderform and clearly indicate each book with both a name and number. Mossad HaRav Kook will be responsible for the correct filling of each order. VG is responsible to get your order to the shipper of your choice within 30 days of the end of the sale. All shipments will be registered and insured. Delivery will be the shippers responsibility.